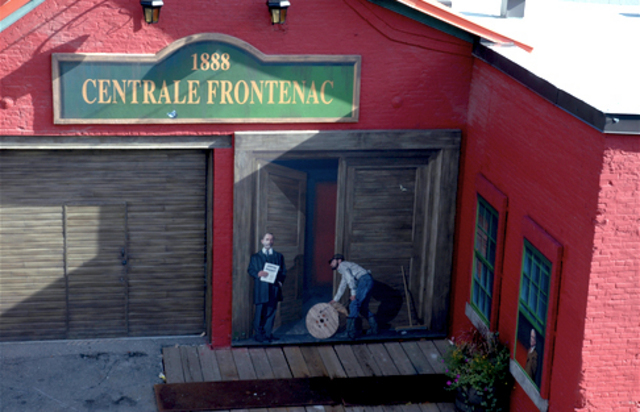 On May 1st 1908, the City of Sherbrooke took possession of the Frontenac power plant and all assets of the Sherbrooke Power Light & Heat Co., sole power supplier of the time. This mural commemorates the centennial of Sherbrooke’s municipalization of electrical power. At that time, the City concurrently created the Département du gaz et de l’électricité de la Cité de Sherbrooke. In 1963, this service was renamed Hydro-Sherbrooke. Nearly six years' worth of efforts and four referendums were required to deliver the project. It is especially thanks to councillors Daniel McManamy and Donat Denault that this goal was reached. The two allies used any and all means at their disposal to convince the population that their idea was valid. One hundred years later, Hydro-Sherbrooke is one of the city’s gems. 100 Years of Services - Find and Seek!